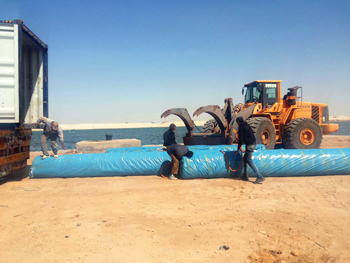 Alyaf geotextiles being laid at the New Suez Canal project in Egypt. Saudi geosynthetics major Alyaf Industrial Company has achieved a major milestone by winning the geotextile supply contract for the prestigious New Suez Canal project in Egypt. In a joint bid with its Egyptian distributor Mawad Trading, Alyaf was selected by the Suez Canal Authority to work on Egypt’s flagship project, ahead of a host of international firms. The multi-billion-dollar waterway project will serve as a second channel and shipping corridor and is expected to double the capacity of the existing Suez Canal, which straddles the Mediterranean Sea and Red Sea and is the main artery for international seaborne trade, especially between Asia and Europe. The project posed huge challenges in terms of technical viability and logistics of timely supply. “Owing to its expertise and past successes in similar projects across the Middle East and Africa, Alyaf was contracted to provide a protective system for the canal embankments,” says Nader Nafady, president and CEO. The project is slated for completion in August 2015, only a year after it was launched by the Egyptian Government. “The tight deadline for development work on the new canal meant there was no room for any delays. Alyaf has a major advantage with its largest regional production capacity and direct Red Sea access to the canal which ensures that supplies are made ahead of schedule,” he adds. In view of the specific application requirements, Alyaf is supplying over 1 million sq m of its high-end XP55 geotextiles for use in canal protection. For over 20 years, Alyaf’s geosynthetic products have been the preferred choice of project owners across the Middle East and North Africa (Mena) region due to their superior quality and techno-commercial viability, Nafady states. Alyaf, which is considered to be the largest manufacturer of geosynthetic products in the Middle East, has successfully supplied more than 500 million sq m of geosynthetic products over the past two decades, and has cemented its position in the region by continually improving its product range. The company reached another key milestone early this year with the inauguration of its fourth production line in Dammam, Saudi Arabia, for the exclusive manufacture of its latest Alyafgeo composite range of products. The Alyafgeo range, designed to cater to the Middle East market, includes the geocomposites drainage systems for civil and environmental engineering applications in collaboration with UK-based GEOfabrics which is a market leader in this field. Alyaf supports its loyal client base with a complete supply package which includes geotextiles, geocomposites, cellular confinement systems, geogrids and geosynthetic clay liners (GCL) for a wide range of geotechnical applications. These include marine construction, road and site improvement, bespoke drainage applications, capillary break layers, salt barriers, roofing systems including specialised garden roof systems, landfills and landscaping. Its diverse product portfolio includes Alfgrid for soil stabilisation; Alfweb three-dimensional cellular confinement system for slope protection; Alfdrain geocomposite drainage and gas venting systems; and Alfgeo green roof systems, salt barriers and capillary break layers, manufactured at its Dammam production facility. “Alyaf’s new and improved product range is a result of two decades of continual innovation. Our dedicated team of technical support engineers has engineered our products to provide customised cost-effective solutions with high performance,” says Nafady. Earlier this year, Alyaf became the first geosynthetics company in the Gulf to achieve the Integrated Management System (IMS) certification encompassing the ISO 9001:2008 quality management system, the ISO 14001:2004 environmental management system, and Ohsas 18001:20007 occupational health and safety system, for its compliance to global standards in quality assurance, environment protection and occupational health and safety.